Ups Defense if there is a status problem. X Its crystalline orbs appear to give this Pokémon the power to freely control the weather. X Ses orbes de cristal donnent le pouvoir de contrôler le climat. X Sus cristalinos orbes parecen darle al Pokémon el poder de controlar el clima libremente. X Pare che le sfere di cristallo diano a questo Pokémon il pieno controllo sulle condizioni atmosferiche. X 수정 같은 구슬에는 날씨를 자유롭게 조종하는 능력이 담겨 있는 듯하다. Y A mystical Pokémon that exudes a gentle aura. It is said to have the ability to change the weather. Y Un Pokémon légendaire plein de charme. Il peut contrôler les variations climatiques. Y Es un Pokémon misterioso. Está rodeado de una sutil aura y tiene la capacidad de cambiar el clima. Y Pokémon etereo che emana un’aura mite e ha la capacità di mutare il clima. Y 오라에 싸여있는 신성한 생명체인 듯하다. 날씨를 바꾸는 힘을 가졌다고 한다. 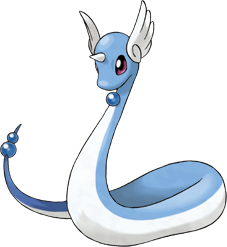 Omega Ruby Dragonair stores an enormous amount of energy inside its body. It is said to alter weather conditions in its vicinity by discharging energy from the crystals on its neck and tail. Omega Ruby Dragonir speichert eine enorme Menge an Energie in seinem Körper. Es kann die Witterung in seiner Umgebung ändern, indem es Energie aus den Kristallen an seinem Hals und an seinem Schweif entlädt. Omega Ruby Draco stocke une quantité d’énergie considérable dans son corps. On raconte qu’il peut modifier les conditions climatiques autour de lui en déchargeant l’énergie contenue dans les cristaux de son cou et de sa queue. Omega Ruby Dragonair acumula grandes cantidades de energía dentro de sí. Dicen que altera el clima de la zona en la que está descargando energía a través de las esferas de cristal que tiene en el cuello y en la cola. Omega Ruby Dragonair accumula un’enorme quantità d’energia all’interno del corpo. Si dice che sia in grado di mutare le condizioni meteorologiche circostanti scaricando energia dai cristalli del collo e della coda. Omega Ruby 큰 에너지를 몸에 모으고 있다. 목과 꼬리의 수정에서 에너지를 발산하여 주변 날씨를 바꾼다고 한다. Alpha Sapphire Dragonair stores an enormous amount of energy inside its body. It is said to alter weather conditions in its vicinity by discharging energy from the crystals on its neck and tail. Alpha Sapphire Dragonir speichert eine enorme Menge an Energie in seinem Körper. Es kann die Witterung in seiner Umgebung ändern, indem es Energie aus den Kristallen an seinem Hals und an seinem Schweif entlädt. Alpha Sapphire Draco stocke une quantité d’énergie considérable dans son corps. On raconte qu’il peut modifier les conditions climatiques autour de lui en déchargeant l’énergie contenue dans les cristaux de son cou et de sa queue. Alpha Sapphire Dragonair acumula grandes cantidades de energía dentro de sí. Dicen que altera el clima de la zona en la que está descargando energía a través de las esferas de cristal que tiene en el cuello y en la cola. Alpha Sapphire Dragonair accumula un’enorme quantità d’energia all’interno del corpo. Si dice che sia in grado di mutare le condizioni meteorologiche circostanti scaricando energia dai cristalli del collo e della coda. Alpha Sapphire 큰 에너지를 몸에 모으고 있다. 목과 꼬리의 수정에서 에너지를 발산하여 주변 날씨를 바꾼다고 한다. Sun It has long been thought that its crystalline orbs are imbued with the power to control the weather. Moon From time immemorial, it has been venerated by agricultural peoples as an entity able to control the weather. Red A mystical Pokemon that exudes a gentle aura. Has the ability to change climate conditions. Blue A mystical Pokemon that exudes a gentle aura. Has the ability to change climate conditions. Yellow According to a witness, its body was surrounded by a strange aura that gave it a mystical look. Stadium Lives in large bodies of water like the sea and lakes. It is said to have the power to change the weather and fly. Gold They say that if it emits an aura from its whole body, the weather will begin to change instantly. Silver Its crystalline orbs appear to give this Pokemon the power to freely control the weather. Stadium2 They say that if it emits an aura from its whole body, the weather will begin to change instantly. Ruby Dragonair stores an enormous amount of energy inside its body. It is said to alter weather conditions in its vicinity by discharging energy from the crystals on its neck and tail. 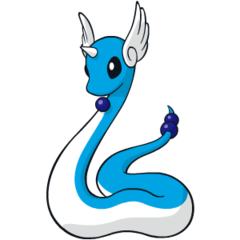 Sapphire DRAGONAIR stores an enormous amount of energy inside its body. It is said to alter weather conditions in its vicinity by discharging energy from the crystals on its neck and tail. Emerald A DRAGONAIR stores an enormous amount of energy inside its body. It is said to alter the weather around it by loosing energy from the crystals on its neck and tail. Pearl If its body takes on an aura, the weather changes instantly. It is said to live in seas and lakes. Platinum If its body takes on an aura, the weather changes instantly. It is said to live in seas and lakes. SoulSilver Its crystalline orbs appear to give this Pokémon the power to freely control the weather. Black If its body takes on an aura, the weather changes instantly. It is said to live in seas and lakes. White If its body takes on an aura, the weather changes instantly. It is said to live in seas and lakes. White 2 If its body takes on an aura, the weather changes instantly. It is said to live in seas and lakes.